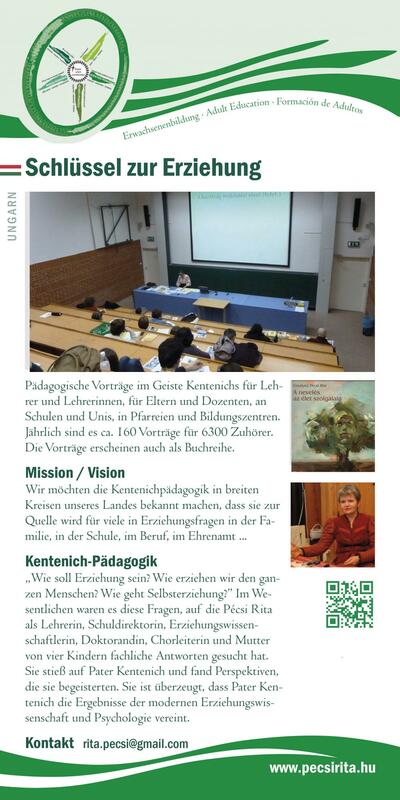 Talks or lectures on pedagogy in the spirit of Fr Kentenich for teachers, parents and lecturers in schools, universities, parishes and training centres. Each year about 160 talks or lectures are given to about 6300 people in many towns and places in Hungary. What is education meant to be? When is it a success? How do we educate the whole person? How does self-education work? These were the questions for which Pécsi Rita, as teacher, school principal, educational researcher, doctoral candidate, choir leader and mother of four children sought competent answers. She discovered Fr Kentenich and found perspectives that awakened her enthusiasm.